This page will help answer questions about Kiz Phonics and how the membership system works. Kiz Phonics is a phonics instructions site, which offers complete materials for teaching phonics. Materials are arranged by Level for those who want to follow a systematic approach to teaching phonics. They are also organized by type for those who choose a non-systematic approach to teaching phonics.What is Phonics anyway? Phonics is a method of teaching children to read and write by learning the sounds associated with different letters or letter combinations. Extensive research over several years continue to point to the effectiveness of systematic phonics instructions as the way of teaching children to read. Yes and no. The first 3 to 5 worksheets, videos, games, listening and flashcards under each level are free resources. To use the site beyond that, you need to sign up at a very affordable price. Sign Up Here! Did you misspell ‘Kids’ as ‘Kiz’? No. Our acronym ‘Kiz’ means ‘Kids Intellectual Zone’. It is part of a branding system we developed for all our online education products for children. Please note that not all sites that have ‘Kiz’ in their domain names necessarily belong to us. We were inspired by the sound of the acronym ‘Kiz’ which sounds like how we say ‘Kids’ when speaking more naturally. We then took this inspiration further to define the full meaning of the acronym. It is consistent with our philosophy that kids are naturally built for learning and we are here to create that intellectual zone for them. Who is Kiz Phonics for? b) Home-Schoolers: Kiz Phonics is excellent for parents who want to teach their children how to read at home. Our materials are easy to follow, making it possible for anyone with minimal teaching experience to deliver on the promise of teaching kids to read. c) Private Tutoring: Some teachers start private classes, along side their main jobs, or simply teach full time at home and earn more. Others go to meet kids in their homes. We are your solution. With Kiz Phonics, private teachers can confidently organize “Teach Your Child to Read” courses, based on our materials. Some private tutors organize summer courses with our resources to help children who are struggling with learning to read at school. That is how the extra bucks are earned during times of economic hardships. Be the first teacher to teach little Jimmy how to read. It’s a real thrill! d) Schools: Right now, there are a dozen schools across the globe using Kiz Phonics site and coursebooks as their main course for reading development. Contact us for more information on schoolbooks and licensing. What kind of materials are offered? a) Course Plan: This is a suggested layout on how to follow Kiz Phonics as a reading program. We say ‘suggested’ because every child and scenario is different and you may need to adapt the course accordingly. b) Worksheets: We hired a team of graphic designers to polish our materials in rough form. The result is the finest collection of printables for teaching phonics, you will ever find on the internet. c) Video Tutorials: Wondering how to present the sounds and letters? Do not worry. Our videos have you covered. 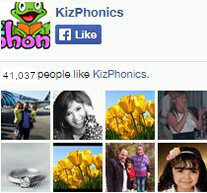 Kiz Phonics provides over 100 videos for teaching different sounds. They are simple, short, highly focused and therefore very effective for teaching children how to associate letters and sounds. The GOOD NEWS is that our videos can play on your iPads, iPhones and other devices that are html5 based and do not support flash. e) Listening Materials: We provide listening materials in playlists for different levels. The listening is meant to sync with the worksheets. 90% of the worksheets have corresponding audio to go with. f) Flashcards: We offer phonemic cards to teach the sounds, grapheme cards to teach letters of the alphabet, word cards, sentences cards and more for teaching phonics. g) Board Game: Our Crocodile board game concept with card sets is a simple idea, yet highly effective and fun way of practising phonics and can be used for just about any other subject. The rules are easy for kids to figure out and when that is done, the fun never stops. Can I photocopy the Worksheets & Flashcards for use in my reading lessons? Copyright for the materials remains with Kiz Phonics. They must not be resold. Materials cannot be redistributed by email or uploaded onto other web sites / servers. You may also not claim authorship of these materials. Can I order hard copies? Yes, we have books and CDs to go with the program which you can buy from our store. Can I download the videos and interactive games? No, you may NOT download Videos and Interactive Games & Quizzes. Interactive rich media contents are not meant to be downloaded. They are for use on site. Do you regularly update content? Yes we do. We never stop working to add content.